To illustrate His lessons, Jesus used illustrations about the grass and flowers of the field, and sparrows to teach God’s care for us. The penny, cent, or copper coin mentioned here is used for the Greek term assarion. The King James farthing represents a coin of the United Kingdom common in the 17th century, but withdrawn from circulation in 1961. 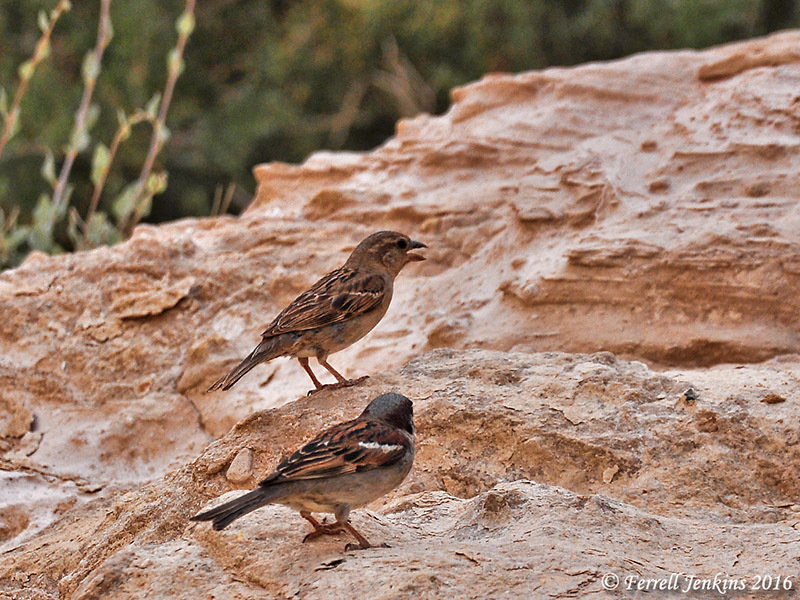 Two sparrows at En Avedat in Israel’s Negev. Photo by Ferrell Jenkins. This Roman copper assarion was worth 1/16 denarius. Some numismatists say this was a quadran, but others say it was larger than the quadran and usually bore the picture of the emperor. This is the term translated farthing in the KJV. The denarius was a Roman silver coin equivalent to the day’s wage for a common laborer (Matthew 20:1-16). Because our currency values vary by the day it is difficult to translate the terms describing coins of Jesus’ time. Sparrows were a very cheap article sold in the market as food for the poor. They were sold by the pair or in fives. The market price was two sparrows for an assarion. “Even in small things Jesus is great. The unerring eye for actualities that asserts itself so repeatedly in the gospel parables comes out also in the saying about the sparrows… Jesus was in his true element in the market-place, watching a poor woman counting her coppers to see if she could still take five or ten sparrows home with her. Poor, miserable little creatures, fluttering there, such numbers of them, in the vendors’ cages! A great many can be had for a very small sum, so trifling is their value. And yet each one of them was loved by the Heavenly Father. How much more will God care for man, whose soul is worth more than the world!” (Light From the Ancient East 272-5). If the Lord cares for the sparrow, he certainly cares for you — and me. Over the years I have eaten my share of fried chicken while visiting with my brethren (and I love it), but I would need to be real hungry to eat the pulley bone (it’s a southern thing) of a little sparrow. 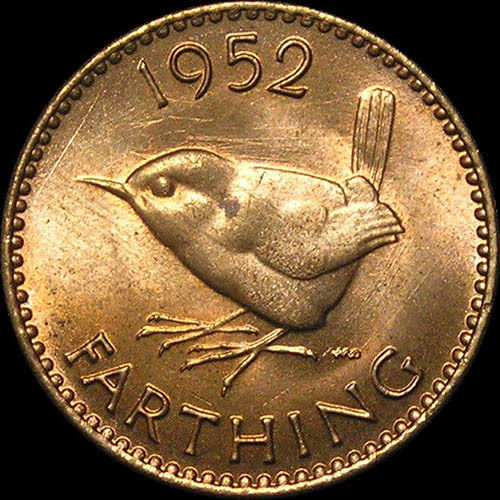 If you have never seen a farthing, just search the Internet for farthing images and you will locate many. Instead of a sparrow, they carry the image of a wren on the reverse side. The one here is from the web page of wybrit.com, a source from which one may buy farthings. Reverse of a United Kingdom farthing minted in 1952. The obverse carries the image of King George VI. Photo from wybrit.com. 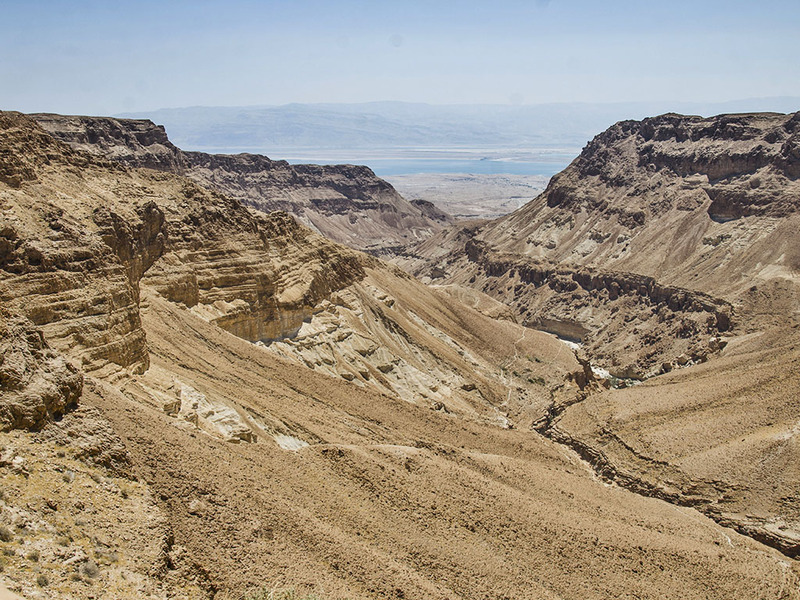 The Dead Sea Scrolls were discovered in caves along the western shore of the Dead Sea in 1947. In the years that followed, documents from the time of Bar Kochba’s revolt (A.D. 135) were discovered. At least some of the biblical texts and those from the second century A.D. can be seen at the Shrine of the Book in Jerusalem. The rebels were united under the leadership of one man: Simeon Bar Kokhba. The revolt resulted in the emergence of a short-lived independent state marked by the organization of local authorities, the issue of coinage, and the leasing of state land. 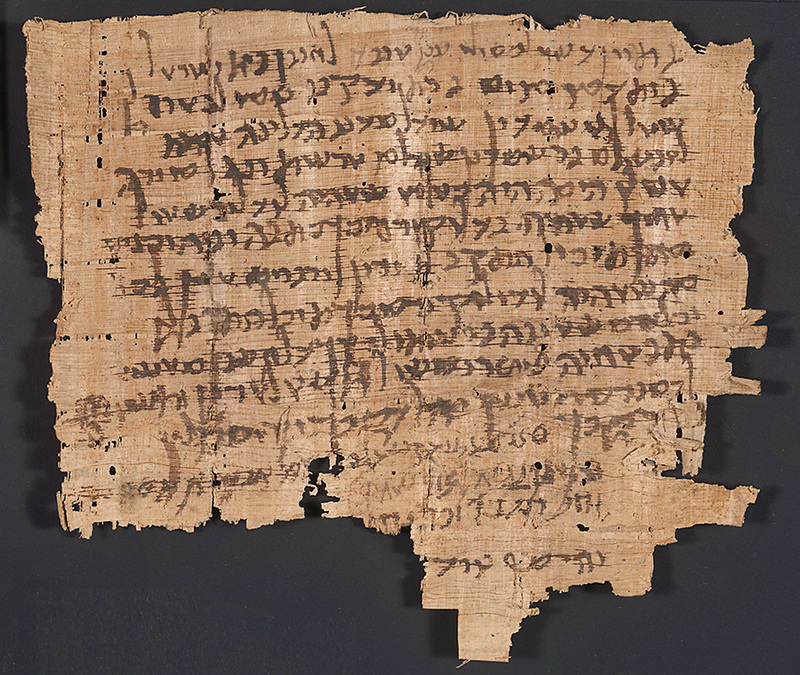 The ancient text that dates to the Year Four of the Destruction of the House of Israel (139 CE), which was seized in a joint operation by the Unit for the Prevention of Antiquities Robbery and the Israel Police. Photographic credit: Shai Halevi, courtesy of the Leon Levy Digital Library, Israel Antiquities Authority. The effort currently underway involves archaeologists and volunteer workers searching for pottery, scrolls, fragments, etc. in caves at Nahal Tse’elim, a site about 1½ miles north of Masada. I prepared some of the photos provided by the Israel Antiquities Authority last evening, but did not have time to work on the post. This morning I see that Todd Bolen, Bible Places, has posted info. I decided to go ahead with this post for the 5 people who don’t read the Bible Places Blog and include different photos that others might enjoy and find useful. A general photograph of Nahal Tse’elim. Photographic credit: Yoli Shwartz, courtesy of the Israel Antiquities Authority. The climb up (or down) to the cave is difficult. Access to the cave is complicated and for safety’s sake requires the use of rappelling equipment. Photographic credit: Yoli Shwartz, courtesy of the Israel Antiquities Authority. Volunteers sift the dusty soil in hopes of finding some little scrap of a document or some other valuable item. Volunteers at work in the archaeological excavation. Photographic credit: Yoli Shwartz, courtesy of the Israel Antiquities Authority. The IAA release included a video with the narration in Hebrew. Bolen calls attention to a brief video with English explanation at Arutz Sheva here. Some archaeological projects keep their best stuff hidden away for decades. A word of thanks to the IAA for making material like this available to a wider audience. “Location, location, location” is a phrase commonly used by realtors to describe the ideal plot or house for the prospective buyer. For some it means being near shopping. For others it means being near work. And for others it may mean being near recreational facilities, good schools, etc. Last Sunday I was teaching John 4 regarding Jesus’ travel through Samaria and his stop at Jacob’s well. I mentioned that it is difficult now to get a good photo of the valley flanked by Mount Gerizim and Mount Ebal. I used this photo that I made in 2011 that provides a reasonably good view. I suggest you click on the photo for a larger image. View west of the valley between Mount Gerizim (left-south) and Mount Ebal (right-north). Photo by Ferrell Jenkins. This valley was an ideal location for many biblical events. Some of the significant events associated with the area are listed below. Shechem is the first city of Canaan mentioned in the Bible. The land promise to Abraham was restated here (Genesis 12:6-7). Jacob and his family settled at Shechem (Genesis 33:18). 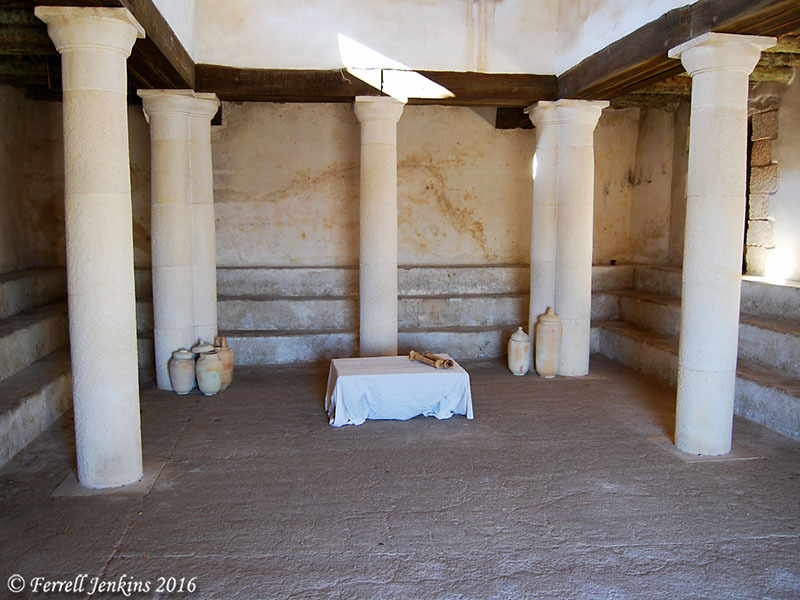 Jacob purchased a parcel of ground and erected an altar here. Joseph’s brothers had gone from Bethlehem to near Shechem to graze their flocks (Genesis 37:12-13). After entering Canaan, the Israelites gathered at Shechem on Mount Gerizim and Mount Ebal to hear Joshua read the blessings and curses of the Law (Joshua 8:30-34; cf. Deuteronomy 28-30). Shechem was within the territory of Ephraim and served as a city of refuge (Joshua 20:7; 21:21). Joseph was buried in a parcel of ground bought by Jacob (Joshua 24:32). The Shechemites supported Abimelech in his bid to be ruler and gave him money from their temple of Baal-berith (Judges 8:33; 9). Jotham’s addressed the people of Shechem from Mount Gerizim with a fable (Judges 9:7ff.). After the Exile, Shechem became a major religious center of the Samaritans. Their temple was built on Mount Gerizim (John 4:20-21). Jesus visited Jacob’s Well near Shechem (John 4). The general vicinity around Shechem was associated with the northern kingdom of Israel after the death of Solomon. Shechem served as the temporary headquarters for the northern kingdom (1 Kings 12:25) beginning about 931 B.C. The capital of Israel was moved to Tirzah during the reign of Baasha (908-886 B.C. ; 1 Kings 15:21; 16:16). After six years at Tirzah, king Omri (885-874 B.C.) purchased the hill of Samaria for his capital (1 Kings 16:24). The capital remained there until the city was captured by the Assyrians in 722 B.C. Tirzah is located about 7 miles northeast of Shechem, and Samaria is about 7 miles northwest of Shechem. In introducing the series of articles on Shechem in the same issue of Biblical Archaeologist, G. Ernest Wright used the title “Navel of the Land.” That makes it fairly easy for us to remember it’s location on the map. For additional posts on Shechem, Gerizim, Jacob’s Well, or the Samaritans, type one of the terms in the search box. 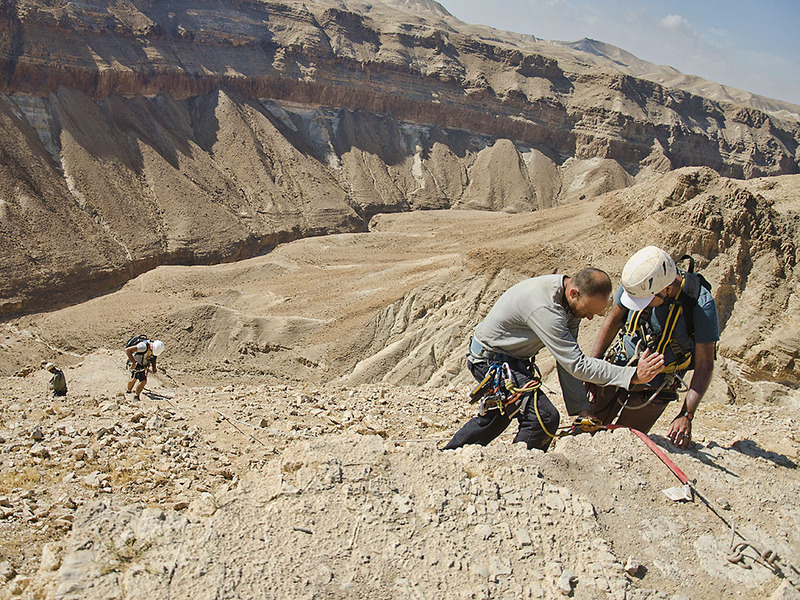 Divers Ran Feinstein (R) and Ofer Ra’anan after discovery. 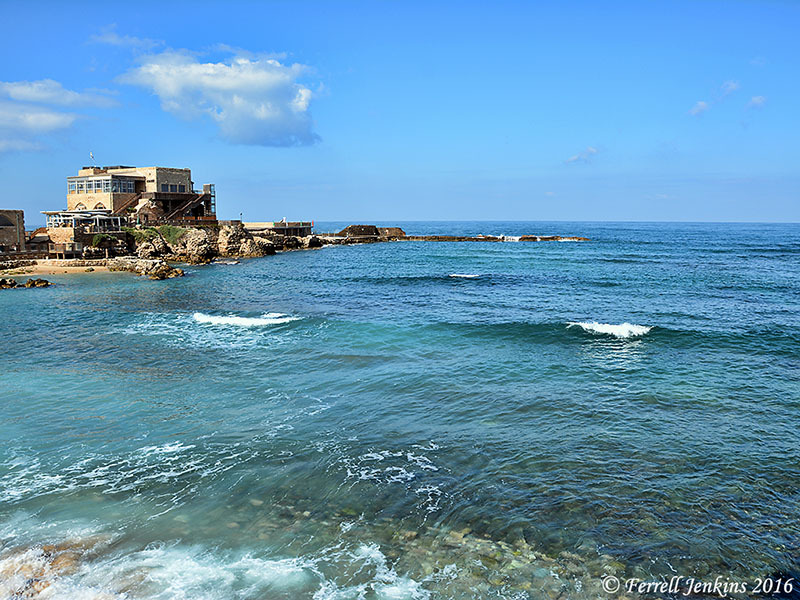 Credit: The Old Caesarea Diving Center. As soon as they emerged from the water divers Ran Feinstein and Ofer Ra‘anan of Ra‘anana contacted the Israel Antiquities Authority and reported the discovery and removal of several ancient items from the sea. A joint dive at the site together with IAA archaeologists revealed that an extensive portion of the seabed had been cleared of sand and the remains of a ship were left uncovered on the sea bottom: iron anchors, remains of wooden anchors and items that were used in the construction and running of the sailing vessel. 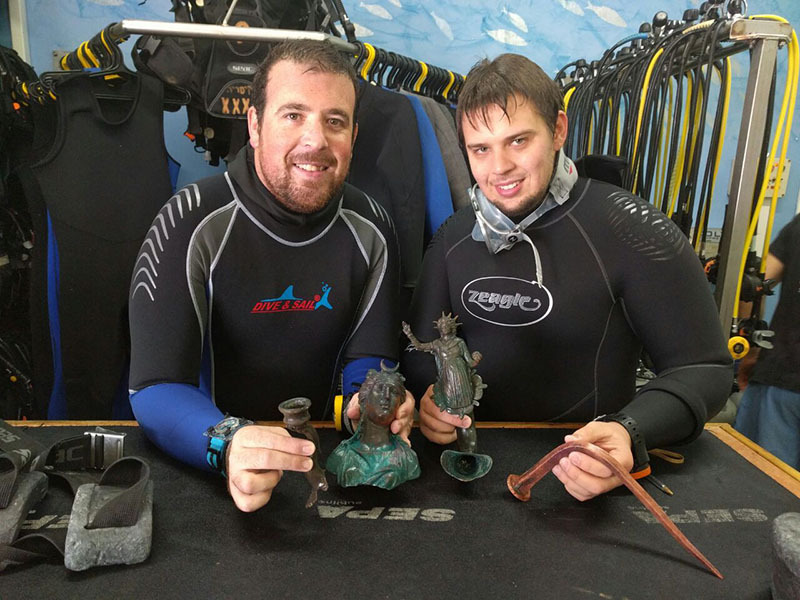 An underwater salvage survey conducted in recent weeks with the assistance of many divers from the Israel Antiquities Authority and volunteers using advanced equipment discovered numerous items that were part of the ship’s cargo. Many of the artifacts are bronze and in an extraordinary state of preservation: a bronze lamp depicting the image of the sun god Sol, a figurine of the moon goddess Luna, a lamp in the image of the head of an African slave, fragments of three life-size bronze cast statues, objects fashioned in the shape of animals such as a whale, a bronze faucet in the form of a wild boar with a swan on its head, etc. In addition, fragments of large jars were found that were used for carrying drinking water for the crew in the ship and for transportation at sea. One of the biggest surprises in particular was the discovery of two metallic lumps composed of thousands of coins weighing c. 20 kilograms which was in the form of the pottery vessel in which they were transported. “These are extremely exciting finds, which apart from their extraordinary beauty, are of historical significance. The location and distribution of the ancient finds on the seabed indicate that a large merchant ship was carrying a cargo of metal slated recycling, which apparently encountered a storm at the entrance to the harbor and drifted until it smashed into the seawall and the rocks”. A preliminary study of the iron anchors suggests there was an attempt to stop the drifting vessel before it reached shore by casting anchors into the sea; however, these broke – evidence of the power of the waves and the wind which the ship was caught up in”. Sharvit and Planer stress, “A marine assemblage such as this has not been found in Israel in the past thirty years. Metal statues are rare archaeological finds because they were always melted down and recycled in antiquity. When we find bronze artifacts it usually occurs at sea. 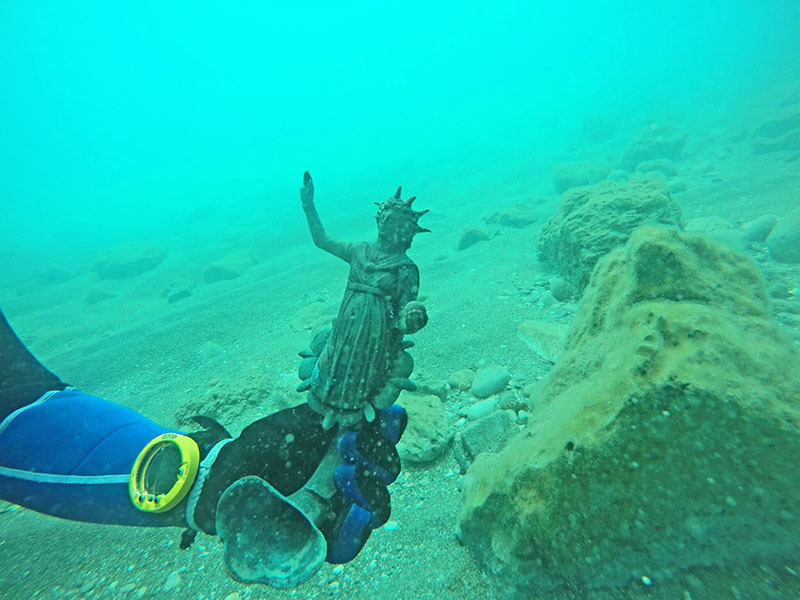 Because these statues were wrecked together with the ship, they sank in the water and were thus ‘saved’ from the recycling process”. Sharvit and Planer added, “In the many marine excavations that have been carried out in Caesarea only very small number of bronze statues have been found, whereas in the current cargo a wealth of spectacular statues were found that were in the city and were removed from it by way of sea. The sand protected the statues; consequently they are in an amazing state of preservation – as though they were cast yesterday rather than 1,600 years ago”. The coins that were discovered bear the image of the emperor Constantine who ruled the Western Roman Empire (312–324 CE) and was later known as Constantine the Great, ruler of the Roman Empire (324–337 CE), and of Licinius, an emperor who ruled the eastern part of the Roman Empire and was a rival of Constantine, until his downfall in a battle that was waged between the two rulers. The harbor at Caesarea. The Apostle Paul used this harbor many times during his preaching tours, and from here was taken to Rome to stand trial before Caesar. Photo by Ferrell Jenkins. Eusebius of Caesarea (c. A.D. 265–c.339), often designated “The Father of Church History,” was active at Caesarea at the time this ship sank. Here are photos of some of the items discovered. A figurine of Dionysus, the god of wine. 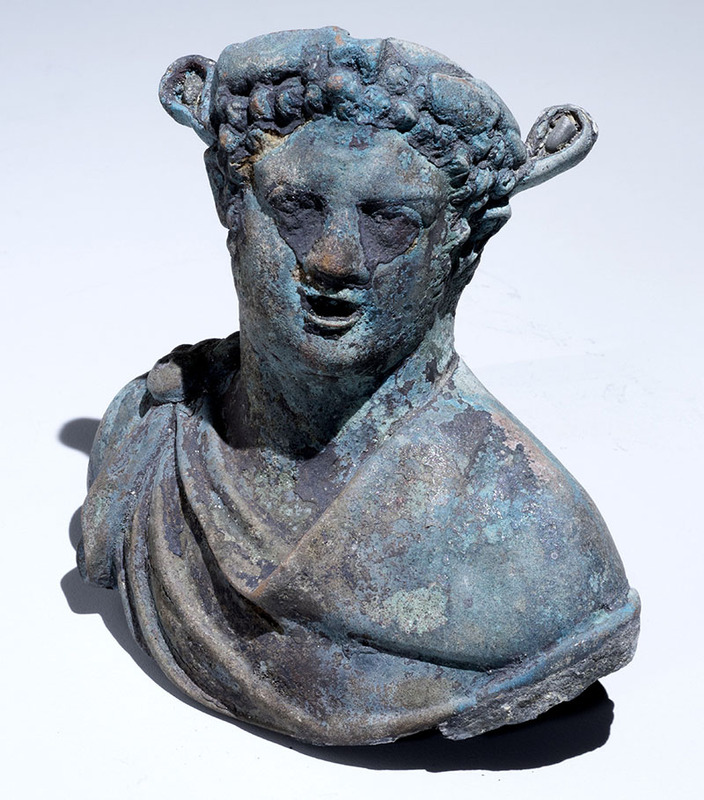 Photo: courtesy of the Israel Antiquities Authority. And, a new way to preserve your money. 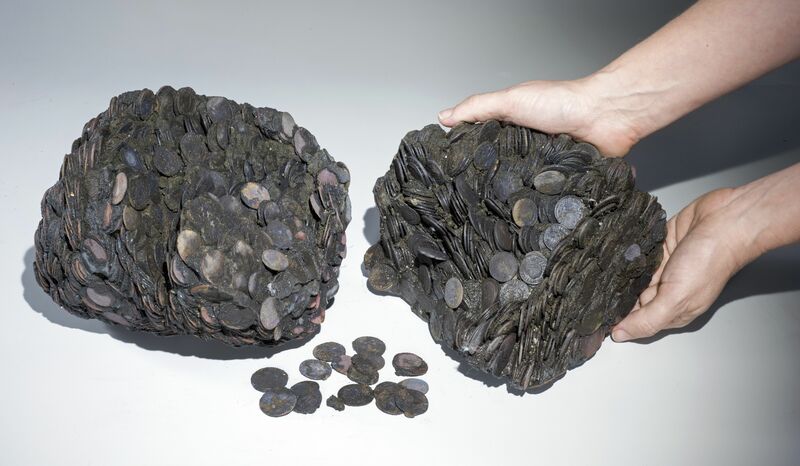 Lumps of coins that were discovered at sea, weighing a total of c. 20 kilograms. 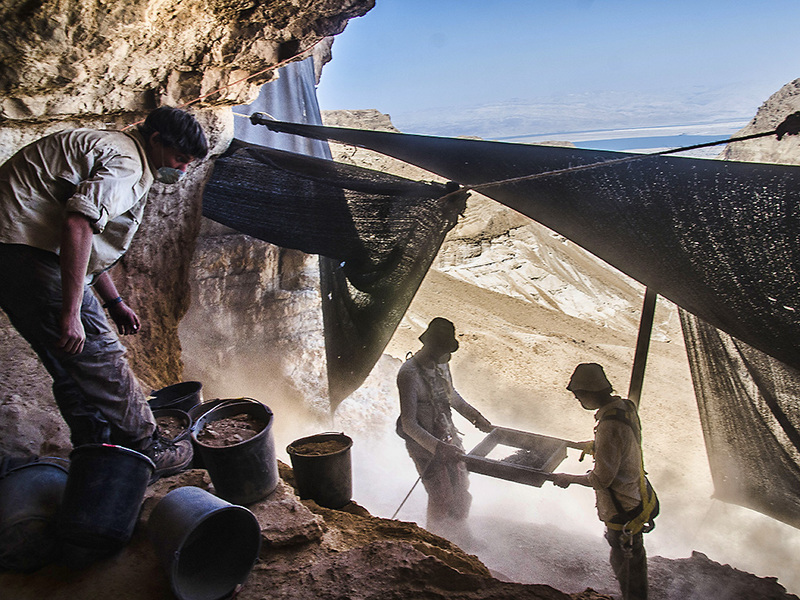 Photographic credit: Clara Amit, courtesy of the Israel Antiquities Authority. Decorated lamps with twice the light. A bronze lamp decorated with the image of the sun god Sol. Photographic credit: Clara Amit, courtesy of the Israel Antiquities Authority. 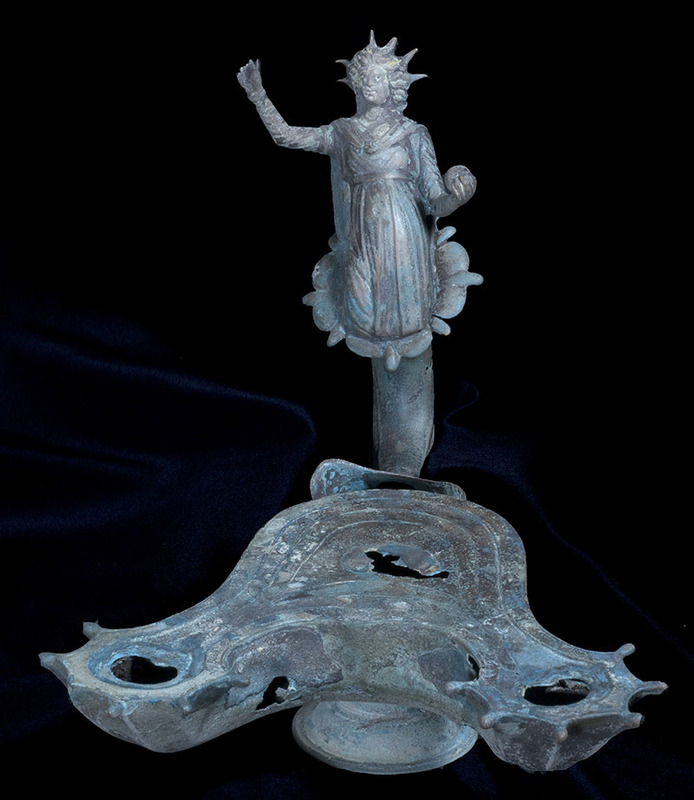 Fragment of a bronze lamp decorated with the image of the sun god Sol, as discovered on the seabed. Photo: Ran Feinstein. And the nicest thing about all of this… According to the release, the two divers will be invited to tour the storerooms of the National Treasures. I may take up diving. “Solomon’s Pools” are a significant historical treasure worthy of full protection by those entrusted with their upkeep. 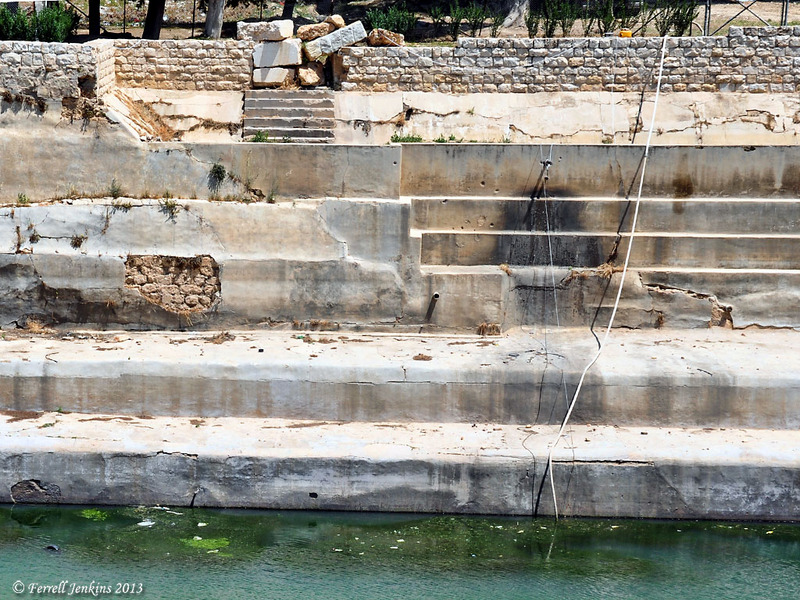 According to a report in Ynet, visitors to Solomon’s Pools report collapse of one of the walls here. You need to visit this site to see photos of the reported damage. Solomon (ruled about 970–931 B.C.) gets credit for several things he had nothing to do with. The pools, located south of Bethlehem, date to the Hasmonean period (about 100 B.C.) and supplied water to Jerusalem, including the Temple area through a series of aqueducts. We suggest you read our article about Solomon’s Pool, including photos of all three pools or reservoirs here. I wanted to add a photo I made in April, 2013, illustrating the need for repair in the eastern pool that I observed at the time. Who is responsible for the care of these famous pools? The answer lies in a complicated system of zones laid out in the Oslo 2 Accord. The West Bank was divided into three zones, A, B, and C. Zone A is to be fully controlled by the Palestinian Authority. Zone B is under Palestinian civil control and joint security control by Israel and the Palestinians. Zone C is under full Israeli control. Solomon’s Pools are in Zone A and should be cared for by the Palestinian Authority. I don’t want anyone to get uptight about some perceived political bias here. I have pointed out before that ancient Samaria (Sebaste) is part of the Israeli National Parks system and is in need of serious attention. Jesus left the shores of the Sea of Galilee and Capernaum to return to Nazareth to teach the people there. When he left Nazareth He “went about among the villages teaching” (Mark 6:6). 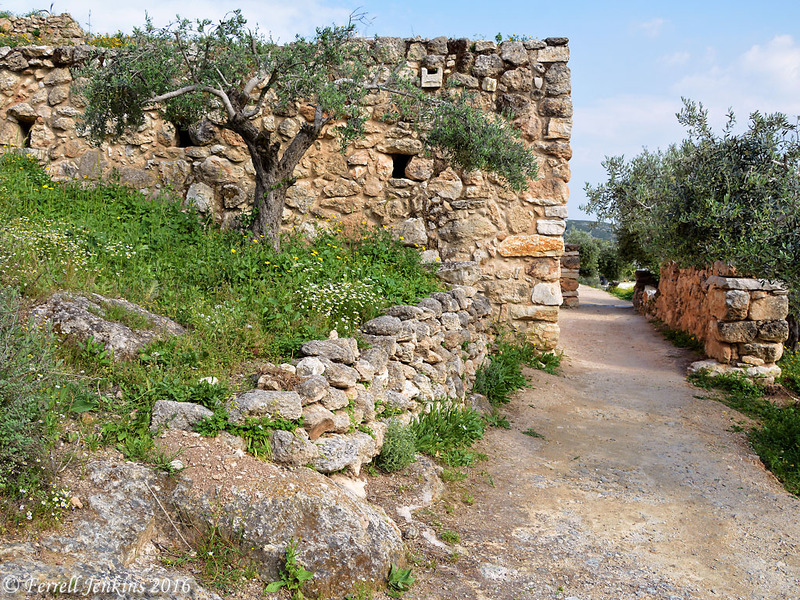 When I see the scene depicted at Nazareth Village of the stone house, the olive trees, and the dusty path, I recall the visits Jesus and His disciples made throughout Galilee. A dirt path and one of the houses at Nazareth Village. Photo by Ferrell Jenkins. Lois Tverberg, in her excellent book Walking in the Dust of Rabbi Jesus, has written a helpful work about Jesus and His teaching drawing on the Jewish concept of the rabbi and his disciples. The way Jesus taught his first disciples was not unique but part of a wider tradition in Judaism that began a few centuries before his time. Jesus didn’t hand his disciples a textbook or give them a course syllabus. He asked each one of them to follow him— literally, to “walk after” him. He invited them to trek the byways at his side, living life beside him to learn from him as they journeyed. His disciples would engage in life’s activities along with him, observing his responses and imitating how he lived by God’s Word. There must have been a buzz of excitement when Jesus and His disciples walked the dusty paths of Nazareth, and indeed, of all Galilee. When Jesus came to Nazareth He entered the synagogue on the Sabbath day and participated in the study. Synagogue reconstruction at Nazareth Village. Photo by Ferrell Jenkins. Lee Levine of Hebrew University summarizes the archaeological evidence for known first century synagogues. The New Testament writers mention other synagogues such as the one at Nazareth. It is unfortunate that the residents of Nazareth did not want to get dusty. Are you dusty from following Jesus? The events of Joshua 9 and 10 are likely well-known to all readers of this page. After the Israelites entered Canaan and captured Jericho and Ai, the inhabitants of Gibeon acted craftily to deceive the Israelites into making an alliance with them. Even though Israel had been deceived they kept their end of the bargain when the Gibeonites were threatened. Adoni-zedek, king of Jerusalem, headed up a group of Amorite kings to fight against Gibeon. The LORD helped Israel by sending large hailstones upon the enemy. Joshua spoke to the LORD in the presence of Israel: “O sun, stand still at Gibeon, And O moon in the valley of Aijalon” (Joshua 10:12). Gibeon sits on the central mountain range about 6 miles north, and slightly west, of Jerusalem. As one makes the descent from Gibeon westward toward the coastal plain he goes through the valley of Aijalon. 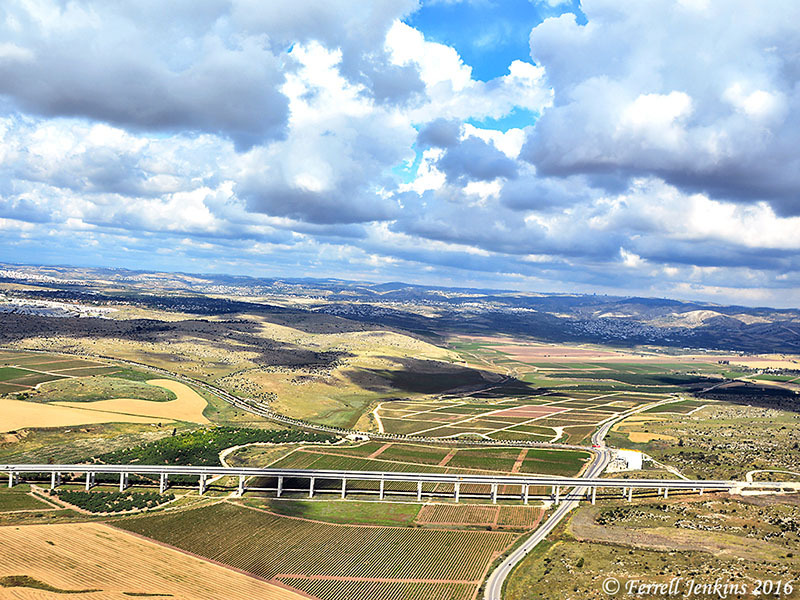 When we travel on the modern highway from Jerusalem down to the Ben Gurion Airport we cross over the valley of Aijalon. Our photo of the valley is made below traditional Emmaus (Nicopolis) looking northwest. The terrain shows the Shephelah, or as many English versions indicate, the lowland. To the right is the way up to Gibeon. To the left one continues past the towns of Aijalon and Gezer down to the coastal plain. 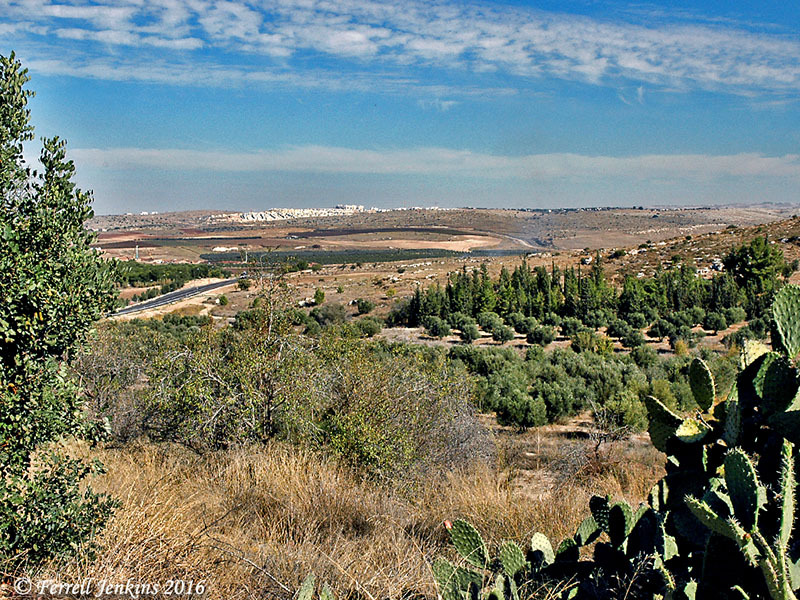 Aijalon Valley from the Latrun Interchange on Highway 1. 2005 Photo by Ferrell Jenkins. In April I flew over the Aijalon Valley in approximately the same area. This perspective provides a better view of the valley. We were avoiding the afternoon storm clouds on our way from Jerusalem to the Sde Dov Airport at Tel Aviv. Three east-west valleys divide the Shephelah and provide access between the plain and the mountains. To the north is the valley of Aijalon. Further south is the valley of Sorek, and then the valley of Elah. Significant battles took place in the valley of Aijalon and the valley of Elah. The town of Aijalon which overlooks the valley was allotted to the tribe of Dan (Joshua 19:42), but Dan moved to the northern part of the country and Aijalon was considered one of the cities of Judah and Benjamin (2 Chronicles 11:5-12). In the days of King Ahaz the city had fallen under Philistine control (2 Chronicles 28:16-20). Have scientists discovered Joshua’s long day? In 1969 an article began to be circulated in church bulletins, and later by Email, claiming that scientists had found evidence of the missing day of Joshua 10. Harry Rimmer had reported a similar story in The Harmony of Science and Scripture in 1936. There is no truth to this claim. I have an article written in response to it available at BibleWorld.com. An article by Dr. Bryant Wood is available at the ABR web site here.